A widely used cytochemical technique for evaluation of DNA damage associated with apoptosis is the terminal deoxynucleotidyl transferase-mediated in situ end labeling or TUNEL assay. However the TUNEL assay has its drawbacks in that false positive staining makes the assay unreliable as a marker for apoptosis 1-5. A more universal and specific marker for detecting apoptosis associated DNA damage is to measure the morphological changes in nuclei that reflect chromatin condensation into compact masses. 6-7. Further biochemical and cytochemical studies have demonstrated the increased susceptibility of apoptotic DNA to thermal denaturation. Analysis of nuclei by scanning calorimetry to detect thermal induced DNA denaturation and analysis of DNA fragmentation by electrophoresis have shown that intact apoptotic DNA is susceptible to denaturation at lower temperatures then that of non-apoptotic cells 8. Apoptosis is an evolutionarily conserved form of cell suicide, which follows a specialized cellular process. The central component of this process is a cascade of proteolytic enzymes called caspases. These enzymes participate in a series of reactions that are triggered in response to pro-apoptotic signals and result in cleavage of protein substrates, causing the disassembly of the cell 13. Caspases have been identified in organisms ranging from C. elegans to humans. The mammalian caspases play distinct roles in apoptosis and inflammation. In apoptosis, caspases are responsible for proteolytic cleavages that lead to cell disassembly (effector caspases), and are involved in upstream regulatory events (initiator caspases). An active caspase consists of two large (~20 kD) and two small (~10 kD) subunits to form two heterodimers which associate in a tetramer 14-16. As is common with other proteases, caspases are synthesized as precursors that undergo proteolytic maturation, either autocatalytically or in a cascade by enzymes with similar specificity 17. Caspase 3, also known as CPP-32, Apopain or Yama, is a key effector caspase in the apoptotic pathway 18. It is present in many different cell lineages and is responsible for the cleavage of a variety of molecules such as poly ADP-ribose polymerase (PARP), protein kinase Cd, actin and DNA-dependent protein kinase 19-20. Multiple parameter detection of DNA damage and caspase 3 activity simultaneously. Readout – Flow cytometry, Fluorescence 96 well plate reader, Fluorescence microscope. Ease Of Use: Dual parameter results to confirm apoptosis in cells. Compatible with human, mouse, rat, bovine, porcine species. 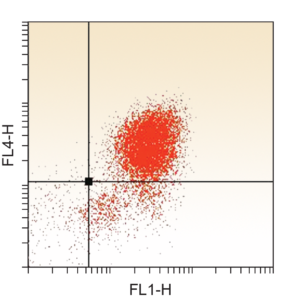 Cell Technology introduces a dual parameter antibody based assay to detect DNA damage (heat denatured single stranded DNA: ssDNA)9-12 and active caspase 3 in apoptotic cells. The assay utilizes a monoclonal antibody generated against ssDNA and a primary rabbit affinity purified polyclonal antibody raised against amino acid 163-175 of murine caspase 3 12. This neo epitope is present on the p18 subunit of cleaved caspase 3 21. Figure A. Negative control: Jurkat cells treated with DMSO for 3 hours and the cells were stained with Fluoro ssDNA Caspase 3 kit as described in the protocol. 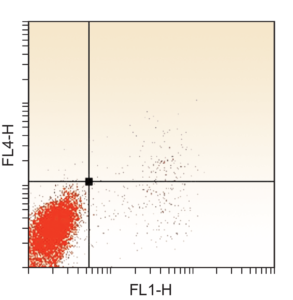 Key: FL 1-H = Anti active ssDNA stain (DNA damage), FL 4-H = anti active caspase 3 stain. Figure B. Positive Control: Jurkat cells treated with 1 mM stauropsorine for 3 hours. The cells were stained with Fluoro ssDNA Caspase 3 kit as described in the protocol. Key: FL 1-H = Anti active ssDNA stain (DNA damage), FL 4-H = anti active caspase 3 stain. Ohno M, Takemura G, Ohno A, Misao J, Hayakawa Y, Minatogu-chi S, Fujiwara T, Fujiwara H (1998) “Apoptotic” myocytes in infarct area in rabbit hearts may be oncotic myocytes with DNA fragmentation: analysis by immunogold electron microscopy combined with in situ nick end-labeling. Circulation 98:1422–1430.